This is one of those unique beers only found in Belgium. The sub-style started when bartenders would put a little sugar or syrup into a young straight lambic right be for serving. In effect, the sugar would help balance out the high acidity found in these beers. A Flemish staple, it caught popularity and is not being bottle by a few Lambic brewers. To retain some of that sweetness in the bottle this beer was filtered and pasteurized to hue fermentation so a candi sugar could be added without bottle conditioning. 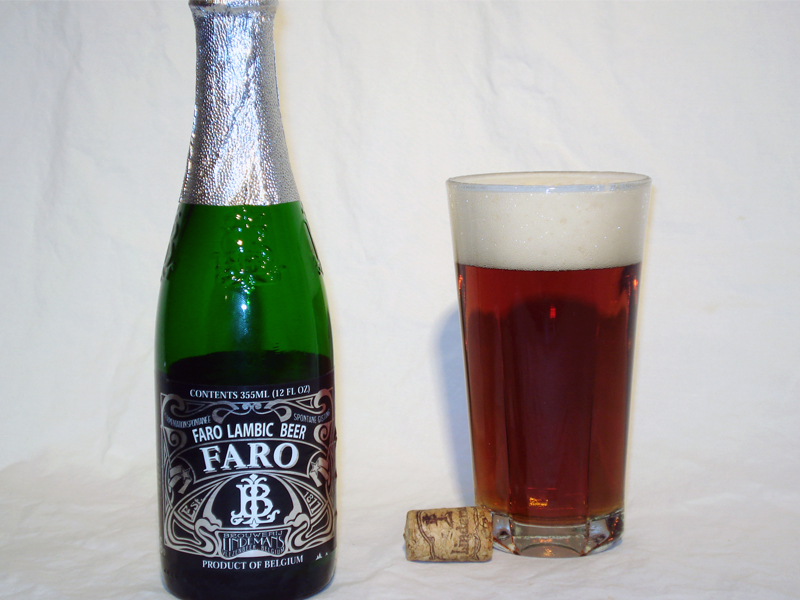 Lindemans Faro was made available in the US just a few years ago in 2010. That said, the color of this beer is a wonderfully clear bronze-copper with an unusually dense white head for a lambic. A very appealing presentation I must say. There is plenty of Brussels lace as I sipped this enjoyable glass. The nose is very interesting. Hidden beneath a sweeter caramel-like aroma the classic funky barnyard lambic qualities come through. Some tartness is noticeable, but for the most part the smell is pretty well balanced creating an almost smooth English pale ale (minus the hops) nose. It is not overtly sweet and the lambic characteristics retain an hay-like earthiness. When I came to the taste, it was hard to get use to at first. The initial sip resulted in a shocking sweetness with minor flavors of funky lambic. A few sips later my palate adjusted and became to recognize more of those barnyard/horse blanket notes. However, the sweetness of the sugar did overpower the taste buds. I can understand the point of lessening the strong acidic punch of some lambic, but isn’t that how they are meant to be enjoyed? In my opinion, I think Lindemans could have gone a little lighter on the sugar … just a tad. When the beer rolls to the back of the palate I was able to get a break down of the candi sugar used in Dubbels and Quads. It was a light sugary mouthfeel, but a slightly stickier nonetheless. An interesting brew that has a cool history and worth a shot.